CLAREMORE, OK (ANS – May 24, 2015) “He asked a third time, ‘Simon son of John, do you love me?’ Peter was sad that Jesus asked him a third time, ‘Do you love me?’ He replied, ‘Lord, you know everything; you know I love you.’ Jesus said to him, ‘Feed my sheep’”—John 21:17(CEB). For over 10 years, my 2001 Honda Passport has sported a bumper sticker stating, “Real Men Love Jesus.” Although women have commented on the slogan, I’ve never had a man mention it—until recently. The light turned green and as we drove off, he gave me a thumbs-up sign. Smiling, I returned his gesture. I’m sure the smile on my face was plastered from ear-to-ear. 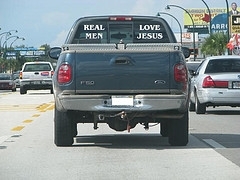 Yawn admits that for years he mocked the bumper sticker that reads ‘Real Men Love Jesus.’ “I considered it an oversimplification and evidence of slogan-driven spirituality,” he says. “I once saw it posted on a billboard strategically situated over a gentlemen’s club. It seemed a foolish gesture. 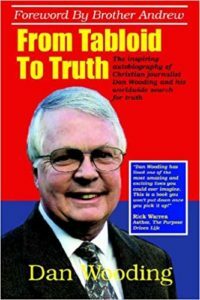 Are we to believe that Jesus can save us from the brazen immorality in our culture? Yes. We must believe it or there is nothing to believe. Do you love Jesus? Then go, and do likewise. Photo capiton: Illustration of the words of Jesus. For more inspiration, visit the author’s website at www.carolaround.com. Need a speaker for your next event? Contact Carol at carolaround@yahoo.com.